Russ on Reading: Standardized Tests: Silly Incentives or Serious Instruction? Standardized Tests: Silly Incentives or Serious Instruction? 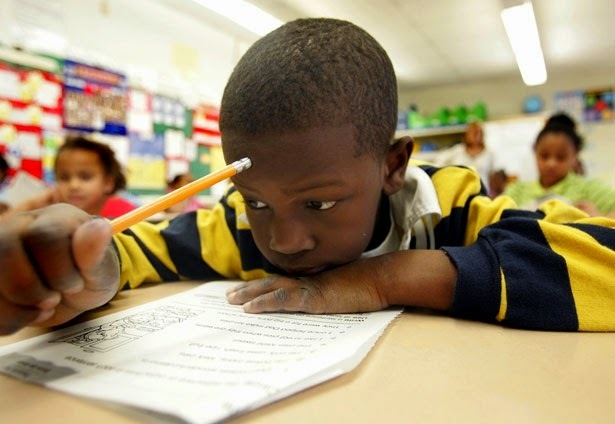 In today's guest post, Cindy Mershon, reading specialist and literacy consultant, asks us to keep the child at the center of our thinking about standardized tests. What is our responsibiity as teachers when kids face the high stakes testing? Cindy's answer includes considering standardized testing as a genre to be taught. Valencia, S.W., Pearson, P.D., Peters, C.W., Wixson, K.K. (1989). Theory and practice in statewide reading assessment: Closing the gap. Educational Leadership, April, pp. 57-62. It is my fault that I chose to read the local paper on Tuesday morning. It is my fault that, when I spied this headline – “Schools Cancel Test Incentives” – I remained in my chair in the kitchen, cocker spaniels in attendance, read the headline, felt the migraine button in my head switch to “on,”, and kept reading. Seems a local school district had planned “to offer incentives, including $5 gift cards, intended to boost student participation and performance on the standardized PARCC exams.” This district had used such incentives in the past, but had recently decided to cancel their plan due to increased “sensitivity” over the heavily debated, upcoming PARCC exams. Reading on, I learned that under said plan, students would have been able to earn points for completing tasks before and after the exams, tasks such as arriving at school on time each morning of the test; preparing for the test by eating a healthy breakfast and getting a good night’s sleep; exerting effort during the test; attending school every day of the testing; and thoroughly checking work after finishing each day’s portion of the test. At the end of the week, the five students earning the most points in each class would have received gift cards from their teacher. I swear on the head of favorite dog Phoebe I am not making this up. Good news is the shocked silence and throbbing migraine of Tuesday have disappeared and I am now receiving stimuli from every book and article I have read on standardized testing. I am now remembering nearly 30 years of studying standardized tests and helping fourth and fifth grade students understand and successfully manipulate the standardized tests that are, for now, a part of their school lives. And I am angry. Again. Still. I am not a fan of standardized tests. I understand their hoped-for purpose but see clearly how they – and their derived scores – are easy to misread and misuse. As a human being and a reading specialist, I, too, long for a quick, easy system of assessment that allows me to plan instruction and help all students to be successful in school - I became a reading specialist because I want all students to have a chance at literacy. But, I have learned that human behavior, and reading and writing acquisition in particular, is simply too complex to be measured in a single, paper-and-pencil assessment given on four days for 45 to 60 minutes at a time. While these assessments – if they are valid and reliable assessments – can add puzzle pieces to the complete picture we hope to create of a reader or writer, they are simply too narrow a measure of reading and writing to provide a comprehensive and accurate picture of students as readers and writers to make judgments about instruction, placement, or the effectiveness of teachers, schools, and districts. And – and this is a big and - if standardized tests are not valid (accurately measure what they say they measure) and reliable (produce stable and consistent results each time they are given), they cannot be used to draw conclusions about any of these issues, and so should not be inflicted on any child. Many, many years ago, an article in The Reading Teacher drew the distinction between a “sow’s ear assessment” and “silk purse data,” and talked about why the first could not possibly produce the second. Yet many people greet the data that results from these less-than-wonderful tests as if Moses has sent it down from the mountain. As “correct” and “accurate.” Test results are published in the newspaper, are used to place children, and are assumed to be “true.” Why? Just how, exactly, do you get good data from a bad test? What possible reason could we have for using bad data to make important decisions about teaching and learning or the quality of schools and school districts? What angers me most about the idea of providing incentives to students for preparation and performance on standardized tests is the lack of respect for children that is clearly communicated by this “game.” Because standardized tests are, for the foreseeable future, a part of students’ school lives, is it not more important to be honest and straightforward with them about what these tests are, why they are given, and how they work? Don’t students need to be included in the conversation that leads to successful experiences with standardized tests rather than offered demeaning and artificial prizes? I believe students need to know they are likely to take these tests once each year, will take them as a part of their college admission process, and will take them yet again if they decide to go to graduate school, medical school, or law school. They need to recognize that their scores on these tests will be recorded and shared with teachers and parents, and that these scores will play a part in painting a picture of them as learners and assessing their success as students. No student equals his or her standardized test score, but those scores are kept in student folders and are typically part of conversations when that student’s school performance is discussed, for good or bad. Students need to understand, too, that standardized tests have limitations, and that interested, responsible educators continue to work to see how (if?) these tests can play a meaningful role in assessing student performance. Students need to know most children in the United States take similar standardized tests, and that standardized tests, especially those in reading and writing, are very similar in format. Students need to know that good classroom instruction in reading and writing is always the best preparation for doing well on standardized tests of reading and writing, but being successful on something you do only once each year can require additional and deliberate study. Preparing students to do well on standardized tests can be accomplished with perhaps 10 reading and writing periods devoted to deliberate instruction of test-taking skills, or with short lessons throughout the school year, but does not need to be the “teaching to the test” curricula discussed in Kamenetz’s book (some schools use up to 25% of their school year to prepare students for the tests, abandoning teaching of their regular curricula). Just as high school students and college undergraduates, who can afford it, attend SAT and GRE preparation courses on weekends or for an hour each week for several weeks, younger students need explicit teaching in understanding the format and parameters of standardized tests without sacrificing their daily school studies and curriculum. · On standardized tests, students work independently for a 45-60 minute prescribed period of time for four or five days. In reading and writing workshop, students are accustomed to working in concert with their teacher and classmates; units cover an extended period of time, perhaps four to six weeks, and a series of units is studied throughout the entire school year. · Standardized tests in reading consist of short passages followed by several multiple choice and one or two short constructed-response questions with stress on a single, correct answer. Students in reading workshop select their own full-length books to read, have an opportunity to talk about their reading at length with the teacher and classmate in conferences and/or book clubs, may write responses to their reading several times each week, and are offered direct instruction in comprehension strategies each day. (This conversation/strategy instruction can also take place during classroom read-alouds.) Emphasis is placed on constructing meaning supported by evidence from the text and the possibility of varying points of view from varying readers: multiple interpretations are possible within the parameters of the text. Students’ classroom reading is continually scaffolded in a variety of ways, while their reading on a standardized test is necessarily done in isolation. · Standardized tests of writing give students prompts for writing and limit writing time to approximately 45 minutes. Students in writing workshop, like reading workshop, often study a particular genre for four weeks or longer and choose their own topics. They confer regularly with both teacher and fellow students and participate in daily direct instruction that supports their knowledge of writing strategies, crafting techniques, and the conventions of writing. Again, writing on a standardized test is an independent task. · Completed work on standardized tests will not be available for examination and discussion by students and teachers working together to assess what was done well and what presented challenges that need to be explored in future work. Work on standardized tests is sent away – to someone from “out of town” to evaluate - and becomes lost to teacher and student for months until scores are returned. When the test data do arrive, the scores are presented as derived numbers that can be difficult to interpret – and easy to misinterpret – and don’t always help teachers know how to help students improve as readers and writers. The only reliable conclusion we can draw from standardized test data is how well students take standardized tests. Directions can also be confusing to young test-takers. Standardized tests of reading frequently ask students to read “a passage,” when in classrooms we talk about reading “books” or “texts.” Many standardized writing tests ask students to write “compositions;” students in writing workshop are used to specific language that asks them to write “personal narratives,” “persuasive essays,” “feature articles,” etc. When young students are anxiously navigating timed tests they take only once each year, unfamiliar vocabulary can confuse them, raise their level of concern, and possibly interfere with their ability to perform at their best. Talking to them about new and different words they might encounter can lower their stress and prepare them for what might appear on the test. The way in which our instruction is presented during these test-taking skills lessons is critical. This is not the time for worksheets done in isolation. This is the time for think-alouds, with the teacher and students talking out loud together, learning from each other, sharing their thinking about test items, test answers, rubrics, and scored writing prompts. Research tells us the primary difference between good test takers and poor test takers, when taking a multiple choice exam, is that the good test takers can identify not only the right answer but know why the other three answers are wrong. Reviewing individual sample test items, talking about which answers are right but also why other answers are not, identifying distractors and how they work – this thinking work can help students learn how standardized tests are constructed and how successful test-takers approach testing. Familiarizing themselves with the rubrics that will be used to evaluate their writing and examining released samples of scored writing shows students exactly what other writers did to earn particular scores on the test. This kind of practice and rehearsal lowers students’ test anxiety while it increases their familiarity with the items they will be asked to manipulate and produce (“I’ve done/seen this before!”). These plans for teaching test taking skills – or test-wiseness – invite students to be a part of the conversation, respect students as stakes holders in the standardized test world, and offer students the best chance for successful performance on standardized tests. While this preparation does not guarantee higher scores on standardized tests, it does provide us with some assurance that students are able to show us what they truly do know and are not hampered in revealing their understanding by unfamiliar formats. Gift card incentives for good preparation and performance on standardized tests skips over this important information and provides students with no strategies for managing standardized tests, be it the first or sixth time they encounter them. Extreme, I know. But every time I come up against issues in education that seem to fly in the face of common sense as well as what research tells us about how children learn, develop, and live, I drift back to this essay. How much of what is happening in education today might be traced back to the thesis of this essay? Does our country, our culture, disrespect and dislike children enough to make decisions about testing, schools, and funding that shortchange students instead of supporting them? If our children are important to us, why not include them, in this case, in conversations and preparation for standardized test in a way that respects their role in the task? They are, after all, the people who will be sitting down to actually take the tests. Yes, they are young, short, and naïve, but they are also intelligent, concerned, and contributing members of our educational community. They deserve to know what they are being asked to do and why, to understand what is at stake when they take part in this task, and to be prepared, in the most productive, meaningful way available to them. Kamenetz, A. (2015). The test: Why our schools are obsessed with standardized testing – but you don’t have to be. PublicAffairs. Kingsolver, B. (1995). High tide in Tucson: Essays from now or never. HarperCollins Publishers.